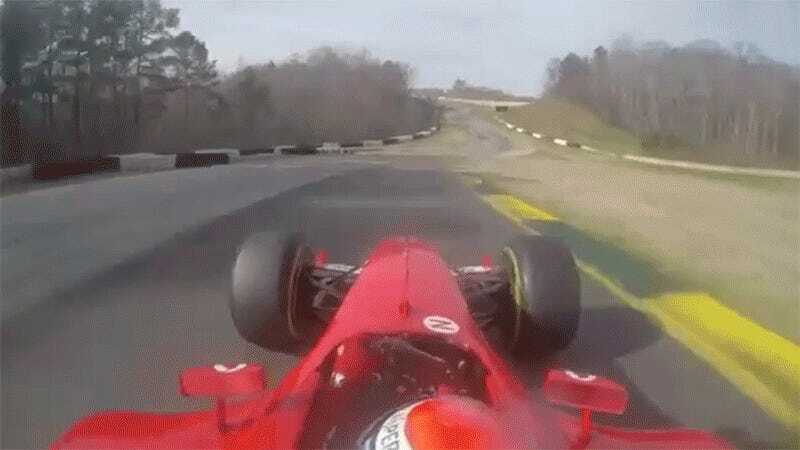 This is a Ferrari F2003GA, with a 3.0-liter V10 that can howl to 19,000 RPM and, as far as this new 1:01.2 lap record of Road Atlanta suggests, bend the fabric of spacetime. I have been lucky enough to drive Road Atlanta. I was in a car that would ostensibly fit strongly into anyone’s standards of “fast.” It was an Audi RS7, as night fell, with the track completely clear. The S curves you see above breathed in full moments, time enough to think each part through as I went through them. Marc Gene in that Ferrari tears through them like they’re a single, sinuous flex. If you’re curious, the previous lap record for Road Atlanta was set in 2008 at Petit Le Mans, back when the top LMP1 cars ran there. A Peugeot 908 diesel tore through at 1:06.242. Now, who has a spare 2003 McLaren lying around?